Personalized, friendly, professional services for the novice and advanced diver alike. Following college, Tom got into the travel business working as an agent, and later, with COMAIR, a Delta Connection Carrier. Following the corporate world, Tom recalls, “throwing up my hands and saying ‘what do I want to do'”. Tom gained his instructor in 1995 and went to work in 1996 at Red Sail Sports in Cayman where he spent six months.. Following 18 months in Freeport, Grand Bahama, Tom was brought back to Cayman, where he worked for Parrots Landing and Tortuga Divers. before managing the business office for eight years at the Cayman Aggressor IV. After 1.5 years away, Tom returned to Cayman with Off The Wall Divers. When not diving in Cayman, Tom is usually diving somewhere else around the world or snow skiing. Another love of Tom’s is the CM Ranch in Dubois, WY. This area of the country was introduced to the him as a youngster and in the 70s, Tom even worked on the ranch. Now, Summer is not complete without a visit to beautiful area of the US. Diving locations: Key Largo and the East Coast of Florida, Dominica, Honduras, Belize, Galapagos, Ireland, North Carolina, BVIs, USVIs, Cozumel, Micronesia (Yap, Chuuk, Palau), and the Philippines. Hobbies: Music of the 60s, 70s, and Carolina Beach music; Royal Doulton collection (over 700 pieces – including numerous prototypes of MLB Baseball Teams and British Football Teams). Snow skiing is a great “release”. Joining OTWD in late 2016, Ben gained his “instructor rating” in 2015 in Tenerife. Hailing from the southeast of England (Kent), Ben first began diving as a teenager, and yes, he learned in a dry suit. Professionally, Grand Cayman was the 2nd stop on his “tour of duty”, and he has not departed. 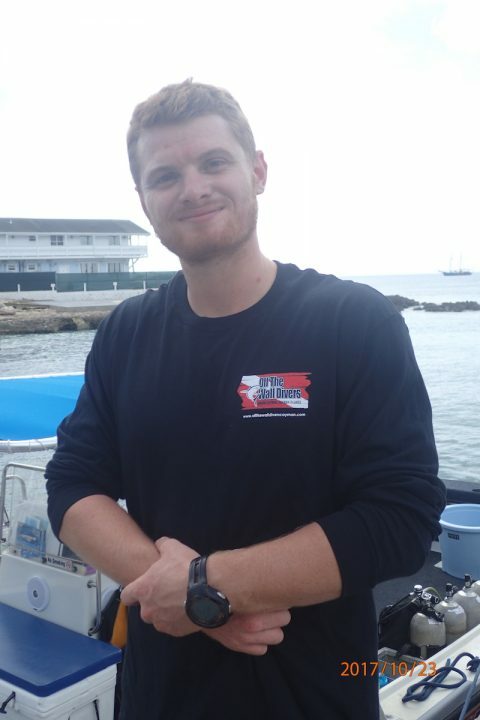 Currently, Ben holds a “master scuba diver trainer” rating with PADI and in the past two (2) years, has earned the PADI Elite Instructor Award. While running the boat is a love of Ben’s, he naturally does dive mastering, and enjoys taking awesome underwater photos. He’ll be happy to assist you too, with your underwater shots. He also enjoys time with his German Shepherd, “Nick” and riding motorcycles. Nakai Coni is a true Caymanian. . . . born and raised not only in Cayman, but under the water. His father, Sergio, is the well-respected manager of Don Foster’s Dive, where he has served for over 25 years. Receiving his instructor at age 18, Nakai worked for his father before joining Off The Wall Divers. Surfing, his career in diving, and star gazing are a few hobbies Nakai enjoys, along with all types of music. Originally hailing from the North Side of Chicago, Illinois, this “city girl” migrated to a small Caribbean island off the coast of Honduras, one of the Bay Islands, Utila. Here, Maria discovered her dream of becoming a dive instructor. Maria’s previous “life” was about the theatre and stand-up comedy. Come join her for some awesome Cayman diving and if you are doing dive training, Maria is an SSI and PADI instructor. 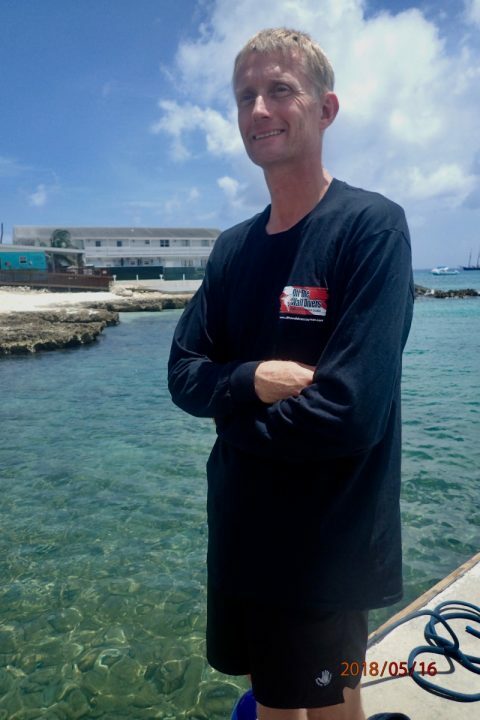 Originating from Leeds, England, David has return to Cayman after a number of year away from the dive industry. 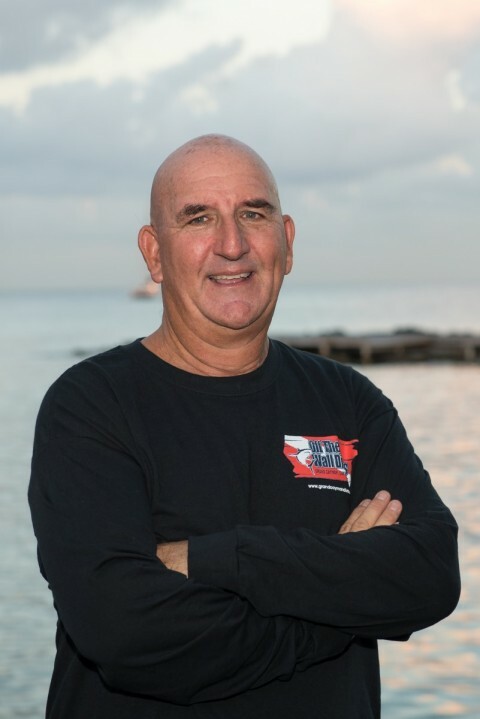 Graduating from Pro Dive (Ft. Lauderdale, FL) in 1994, David first came to Grand Cayman as an instructor at Tortuga Divers (East End), before venturing off to Cairns, Australia. David returned to East End from 2000-2002. During his 2nd term at Tortuga Divers, David met Ms. Andrea Radacher and they ventured to Saba (Sea Saba) for 1.5 years. Eventually, David and Andrea returned to her home country of Austria, where David developed skills as a trained electrician. He also has dabbled in plumbing, metal works, plastering, and roofing. David is a bit of a “fix-it-all” type of guy. When not “getting wet”, David spends his time sharing his wit and corny jokes with staff and diving guests. Diving locations: England, Scotland, Australia, Grand Cayman, Saba, S. Florida, Egypt, and the Sudan. Ryan returns to the dock of Off The Wall Divers in Summer of 2018. After graduating from University with a degree in Mathematics and Economics, Ryan decided to move to the island of Tenerife in 2014 for an eight (8) week period, to become a divemaster… this quickly turned into a year and he left Tenerife as a Dive Instructor, with a new passion, hobby and ‘job.’ Ryan’s first underwater adventures were in the Dominican Republic in 2010. 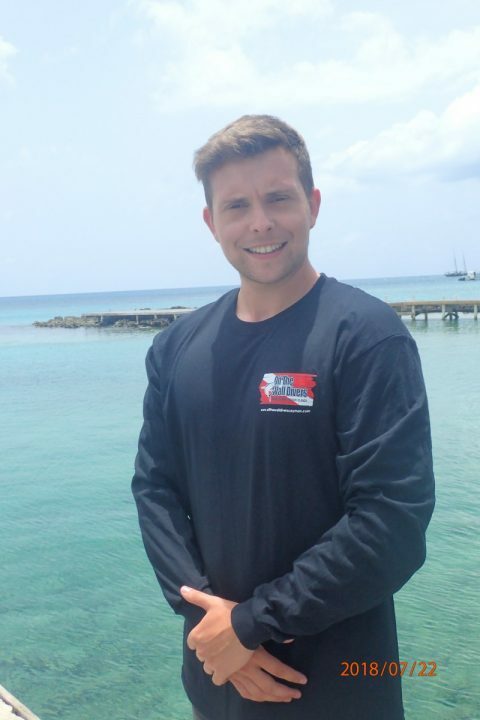 Ryan first arrived in Grand Cayman in the spring of 2015 as an instructor for The Lobster Pot Dive Centre and later worked for it’s sister company, Wall to Wall Diving. 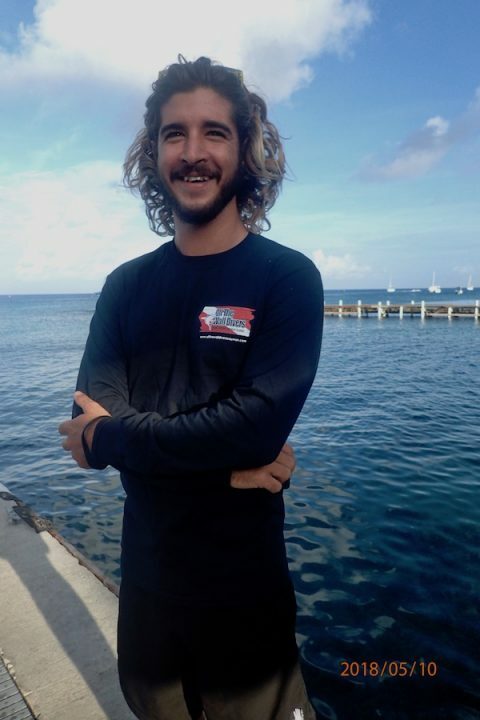 He joined the Off the Wall Divers team in 2018, after a brief period back home in Scotland – the diving, sunshine and Caribbean lifestyle proving too much to resist! Some of his favourite sites to dive are Blackie’s Hole and Eagle Ray Rock on the south west and various sites on the north west including Hepps and Turtle Reef. When not diving, Ryan spends his time either in the gym or on the beach. He loves travelling to new and exciting places and swears he will pluck up the courage one day to dive in the ‘baltic’ cold waters of Scotland! Returning to Cayman for break from the dive industry, Celeste elected to stay, and thus has joined Off The Wall Divers (OTWD) for a six (6) month period. No stranger to the Cayman Islands, Celeste has been visiting the island paradise since she was a youngster. Her grandparents lived her and this is where she learned to love diving. It was not long before Celeste completed her instructor training and went to work for a couple of small operators on the island. She knows the reefs and the dive sites. Seeking something more, Celeste work for a liveaboard in Australia and did whale shark work in Exmouth, Western Australia. Next, she joined the Aggressor Fleet (Bahamas), before landing on her feet with the Turks & Caicos Explorer. “I would hire her before anyone else I have ever worked with in the dive industry,” commented a fellow employee. “She was brilliant with people and serious about her diving and teaching duties. 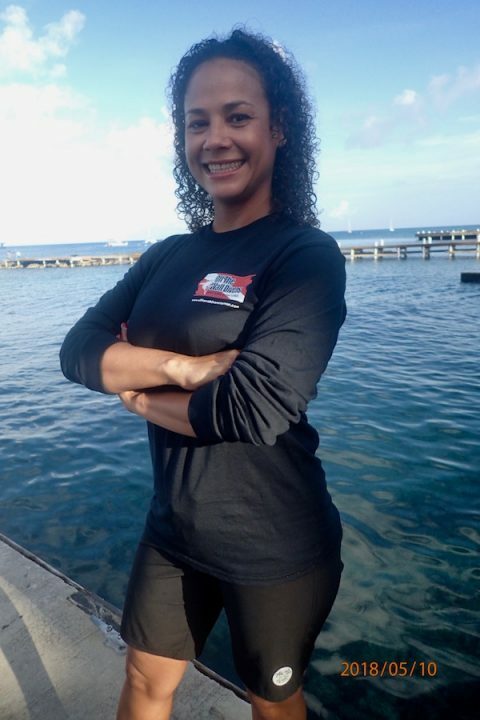 You will see Celeste guiding dives, teaching and running a boat, and we welcome her to Off The Wall Divers. Just returned home from our annual dive vacation. We have been diving with Off the Wall divers yearly for the last 5 years. Once again — a phenomenal trip. 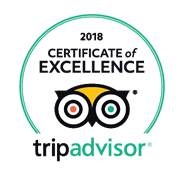 All of the employees are wonderful — they take care of everything — from picking us up at condo, to taking care of all the gear, to asking if you have a preference for dive sites — and great snacks too!! Thanks once again to Tom, Kelly, Meghan, Haley and Mary!! !